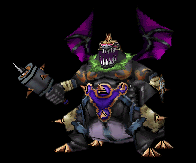 I'm not sure if it's feasible to have every monster that they've included in the Monsters games so far, but if possible combining the monster lists from the DWM2 remake and DQMJ3Pro would be nice, maybe adding some of the all-stars from other Dragon Quest games. I'm fine with the palette swaps as long as they have enough unique monsters too, and there are definitely more palette swaps that they could include. With the capabilities of the Switch, I wonder how many they could add. For skills, DQMJ3Pro has a very good variety of things available, so using that as a baseline and adding more would be nice. Having a good variety of effects and appearances would be nice. That game was perhaps a bit too generous with letting you swap around traits and such, but having some flexibility in customization without turning every monster into "let's put all the broken traits on this one monster and see what happens" could be nice. Speaking of traits, I kind of like the size system and being able to fiddle around with how big monsters are; keeping this and the color change system from DQMJ3, and maybe riding too, would be nice. Something which was present in the original DWM2 that was somewhat deficient in more recent games is having some sort of random dungeon/Magic Key system. Having something to satisfy my inner dungeon-crawler while taking full advantage of however many monsters they add would be awesome, although this naturally shouldn't take away from the actual game play. Also, having some sort of boss gauntlet with all the bosses from the previous games souped-up would be pretty fun, just for nostalgia; what matters most is that there's always a post-game challenge no matter how good your team is. As for the story, I'm not too much of a lore person, but having some call-backs to older Dragon Quest games would be fun. I would care far more about having a good monster variety (including skills and traits), a good competitive scene, good challenge, and some sort of random dungeon-like thing to ensure replayability (Maybe instead of or in addition to the Endless Battle key or whatever, some sort of endless dungeon with occasional boss battles and such could be fun, with rare monsters and skillsets as rewards.) One other small thing: although this is somewhat unlikely, having everything be available without Wi-Fi would be a great added bonus. I don't like how the most recent Joker games forced you to connect to Wi-Fi and deal with that to get additional copies of rare monsters and such. Having the gate or key or whatever like the Game Boy remakes would probably be best. To offer a slightly different opinion on the Magic Key diversity, personally I found it kind of convenient to be able to find some of the weaker-ranked monsters in the Magic Keys; I often liked training up themed teams of some of the weaker monsters (for instance, going for Golem, Dragon, and MadKnight for the DQ1 bosses), so it was helpful to be able to find those without issue. I see why it's annoying to find SpotSlimes in random places when you're looking for more rare stuff, but it's still nice, especially for things like Drackys which actually take some effort to breed. Maybe weighting the keys more toward the higher-ranked stuff would be better, but I feel as if even the lower-ranked things should still be available, even if made comparatively rare. It's fun seeing weak things like Petiteels suddenly end up with really good stats, and as someone who's spent countless hours dungeon crawling Magic Keys on the vanilla version, it would be a shame to see some of that variety disappear. Sure, you can always just spend a bit of extra time breeding them, but that argument applies to every monster. If you're still revising the hack more, you should definitely look at making that an option, especially as it shouldn't affect people hunting for the rarer stuff. Also, as an idea for helping bosses be harder, is there some way to give enemies multiple actions per turn? I'm not quite sure how you would code that, if it were even possible, but making some of the end-game and Magic Key bosses harder and have a distinct advantage over the player could be interesting. Also, some way to force the player to beat a boss within a specified number of rounds (which is a common mechanic in other DQ games) could be fun; for instance, maybe you can recruit a Magic Key boss if you beat it in 5 turns or less or something like that. Estark, who frequently shows up as a post-game boss, has that caveat quite frequently, for instance. As to follow the video most exactly, all of the disks I have created have been the maximum level; however, changing the level does not appear to affect the rewards from the disk. I'm guessing though that there's something else in the game I need to do first to get the results I'm looking for, as before I made this post I went through all of the standard trouble-shooting procedures. Looking at the video may help clarify exactly what I'm doing. That is not the issue though; the issue is the type of monster showing up as the reward not matching the videos or online walkthroughs, not the chance at getting the monster. Even when the codes for the disk are exactly the same as what the people in the YouTube videos are using, the monster rewards are of different ranks than what I am trying to get, and why that is the case is what I am trying to determine. The rewards for completing each disk pop up under the name in the menu when you create them though, so that shouldn't be the issue. I've also completed a ton of them at S-rank anyway hunting for the rank A monsters, and no sort of surprise reward or whatever has popped up. In the videos, they didn't need to complete the disks extra times or anything like that to see what they were supposed to get. Hi all, After beating the post-game for DQMJ3P (with the new final boss), I was looking around for a way to get some of the SS-ranked monsters in a bit less of a tedious manner. According to a few different YouTube videos and Japanese sites (for instance, https://www.youtube.com/watch?v=Ps9SRbfSZ9g), I should be able to get disks with SS-ranked monsters as rewards fairly easily. Despite this, even when using the exact same combinations of key words that they are using in the guides and videos (きらめく and 美しい for the monster key words), I'm not getting any monster rewards past rank A. Is there some additional upgrade or something I need to unlock for the disk machine besides just the key words? None of the Japanese sites I've looked at have said anything besides just using these key words, and even someone's Gamefaqs post didn't seem to indicate there was anything else. What am I missing? @jonahstrix I think especially for a game like this, having the unpredictability is kind of fun, and having Darck replaced with a SpotSlime or having Divinegons appear in Oasis is only part of the fun. Here's a list of features that I kind of hoped to find in a randomizer for this game (some of which may not be too feasible) -Wild monsters, boss monsters, foreign master monsters, and arena monsters are all completely randomized -Base stats shuffled around randomly, or perhaps something to redistribute them with the same totals -Skills shuffled around in a non-buggy way (no HighJump everywhere, and monsters probably shouldn't start with upgraded skills) -Monster families shuffled -If possible, randomize the world maps for Oasis, Pirate, Ice, etc. I'm not sure how you would do this while making sure that the map is still navigable and the same order of events is required (no matter how the Ice map is reshuffled, you still need to beat the mine, go back to Norden and beat "AgDevil," then save the other two castles) -Magic Key monsters should be shuffled somehow, although I'm not sure how (probably in accordance with their new monster familes) -There should be an option to shuffle breeding paths, or at least rearrange them (e.g. KingSlime+GoldGolem always gets you something specific, but whatever it ends up being is random). For extra chaos, arguably the purpose of randomizers, this should at least be an option -There should be some difficulty toggles, at least to the point where if I want I can effectively create a new kaizo hack with every playthrough Just some thoughts. I would definitely agree with the comments above, although I have never had any crashes when viewing monsters with different families even when they weren't vanilla. However, I do think not automatically being given ArmyAnt and MadGopher in Pirate is an interesting change and challenge, particularly for speedrunning attempts; it forces you to plan ahead with catching different families of monsters, or consider doing C class early to get a Magic Key (where spawns aren't randomized and you have a decent chance of getting something that helps). Getting a monster with a dance skill is kind of a pain, although I've had pretty good luck with getting something with either Magic Keys or careful Library checking, and the Kid's Class battle can be beaten even with hard skills (maybe excluding things like HellBlast that demand good RNG to dodge) if you find monsters with good resistances. As for the HighJump moves, through some testing I have discovered that they aren't all the same move; for instance, some crash the game when used through the menu outside of battle, and some do different things in battle (most involve skipping the monster's turn in some way). This should probably be remedied in a better randomizer, but it's avoidable. And I would also say that letting monsters have weird moves in the wild (for instance WhiteAir or WhiteFire) makes some parts easier, but also adds another layer of nuance to the optimal strategy; sometimes weak stats prevent monsters with good skills being useful, and the fickle AI makes it hard to exploit unless you get lucky or spend lots of money on Ribs. Overall, it's a fun randomizer, and with some refinements it could be fun for racing (or even in its current state, competing to see who can unlock Ice Key fastest would be interesting); I also know that some other people have worked on their own randomizers, which are also worth a shot maybe. Thanks! I only have the free version, but I can probably figure out something. I was curious as to if anyone had the sheet music to the DWM2 Battle Music or knew where to find it. I thought it would be interesting to learn how to play. Thanks in advance! Who designed the covers for the games in 2000? The art for Torneko doesn't seem like the type of art you would see for a Dragon Quest game. It's a bit too dark for my liking. And I'm now going to have nightmares about that WindBeast's face. I know that you wouldn't run it on your PC, but you could still have malware that compromises your 3DS. Like Plattym3 said, do not expect that much sense about malware. Maybe you could do something with the eShop. However, this is rapidly getting off track. I would consider downloading a program to bypass region-lock on my American 3DS, but I am paranoid about malware. I haven't been using my 3DS that much lately, but I would prefer not to take the chance unless I have verification that the programs are safe. Back on topic, I have heard that the Infinite Battles after you beat the game in the gate with the jester are fun. Just breed very often and upgrade your skillsets, and you should be fine. 1. Is there a reliable way to get the "Shimofuriniku" without paying? I have been trying to use the drops from the various special events to get some, but it is really slow and arduous. 2. What is the best way to train without waiting for the "Metal Festival" events? 3. What is the best way to upgrade the skills on your monsters? Help would be appreciated.